. "Wilfrid Laurier University". The Canadian Encyclopedia, 19 January 2018, Historica Canada. https://www.thecanadianencyclopedia.ca/en/article/wilfrid-laurier-university. Accessed 20 April 2019. Wilfrid Laurier University, in Waterloo, Ontario, has existed under its current name since 1973, when it became part of the provincially assisted university system. The university's history dates to the early 1900s. 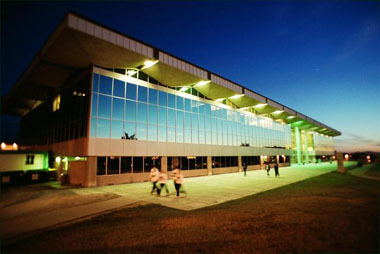 Wilfrid Laurier University, in Waterloo, Ontario, has existed under its current name since 1973, when it became part of the provincially assisted university system. The university's history dates to the early 1900s. In 1910 the Lutheran Church entered into an agreement to establish a Lutheran seminary in the province. The majority of Lutherans in Ontario lived in the vicinity of Waterloo and Kitchener (then Berlin), and Waterloo was selected when its citizens offered a tract of land on the boundary of the town. The Evangelical Lutheran Seminary of Canada opened its doors in 1911. 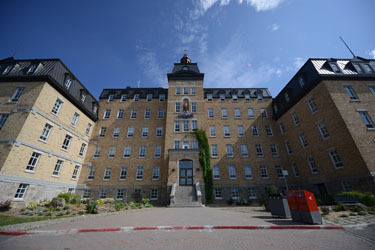 Facilities for pre-theological education were established in 1914 with courses leading to senior matriculation given in Waterloo College School. The Waterloo College of Arts was established in 1924, providing post-secondary courses in a four-year program. A year later the Faculty of Arts, under the name of Waterloo College, affiliated with the ​University of Waterloo and soon began to offer honours degree programs in the arts. In 1959 the Associate Faculties of engineering and science separated from Waterloo College to form the University of Waterloo, some two kilometres away. The affiliation with the University of Western Ontario ended the following year, when the seminary obtained a revised charter, changing the name of the institution to Waterloo Lutheran University. On 1 November 1973 Waterloo Lutheran became Wilfrid Laurier University, named for Sir Wilfrid Laurier, Canada's seventh prime minister. Waterloo Lutheran Seminary remains an affiliate of the nondenominational university and offers several programs at the master's level and a Doctor of Ministry in pastoral counselling and marriage and family therapy. In 1986 the seminary established the Institute for Christian Ethics. In the early 1990s, WLU's administration decided that the existing Waterloo campus was too small to accommodate the rise in student population and that it should create a satellite campus to meet the needs of students from the County of Brant and surrounding areas. As a result, Laurier Brantford, located in the city of ​Brantford, was created in September 1999. Wilfrid Laurier University offers undergraduate degrees in arts and science, music and music therapy, business and economics; master's degrees in arts, business, economics and social work; and doctoral degrees in social work, geography and history. WLU has approximately 8000 full-time and 2000 part-time undergraduate and graduate students. WLU Press, established in 1974, publishes 12-16 scholarly books annually, 13 journals in the humanities and social sciences, textbooks, and works of more general interest. Wilfrid Laurier UniversityThe official website for Wilfrid Laurier University located in Waterloo, Ontario.